Hometown Hope is Waggener Edstrom Worldwide's 2012 global holiday community campaign. Hometown Hope is Waggener Edstrom Worldwide's 2012 global holiday community campaign. Traditionally, WE's annual campaign in November and December aims to engage employees through volunteer events in their local neighborhoods and by giving company funds to nonprofit organizations creating positive social impact in peoples' lives. According to the United Nations Commission on Human Rights, an estimated 100 million people worldwide are homeless and an additional 1.6 billion people live without adequate housing. Economic empowerment is a focal cause for WE, and providing access to safe, affordable housing is critical to empowering people to pull themselves out of poverty's vicious cycle. As a signatory of the United Nations Global Compact, the agency is committed to supporting the United Nations Millennium Development Goals, including the goal to eradicate extreme poverty and hunger. In December, WE will invite employees to help the company determine how it will share a $15,000 donation among four nonprofit organizations addressing homelessness — Footprints-P.L.A.Y., Habitat for Humanity China, Kids Company, and Volunteers of America-Greater New York. Each of these organizations, which employees have supported through volunteer efforts and financial contributions in the past, serves disadvantaged men, women, and children in regions where WE has offices. 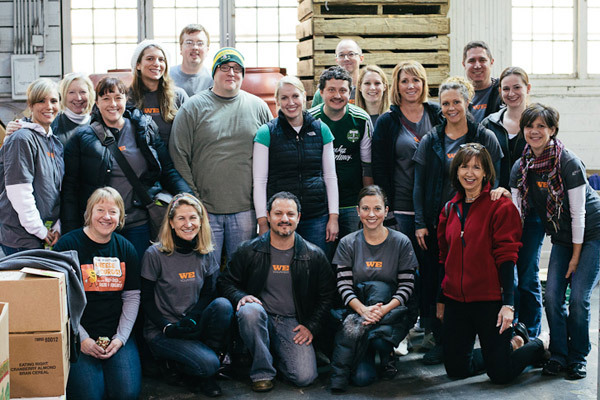 This season WE is also providing employees with volunteer opportunities at organizations such as the Portland Police Bureau Sunshine Division, San Francisco and Marin Food Banks, United Way, and many more that combat homelessness. The agency expects up to 15% of its employees to volunteer more than 500 hours in just two months. In the lead up to Thanksgiving, more than 60 employees had already donated their time, helping more than 1,500 individuals struggling with homelessness. In addition to volunteer efforts and its major end-of-year donation, WE participated in #GivingTuesday, a US national day of giving at the start of the annual holiday season. WE's Tool Shed for Sandy campaign benefitted the Red Hook Initiative, an organization helping to rebuild homes in Red Hook, a low-income community in New York that was devastated by Hurricane Sandy. During its campaign, WE matched employee donations to the Red Hook Initiative and encouraged employees to contribute new and gently used tools to collection sites at its U.S. offices. As events take place, WE showcases stories about employees' volunteer experiences on the corporate intranet, its “Out & About” corporate citizenship newsletter, Twitter (@WE_Citizen) and its Corporate Citizenship blog with a goal of encouraging others to get involved and driving awareness of organizations and their missions.